High Speed WIFI in house with Netflix to catch up or watch the Best Sunrise on the Lake with a private covered oversized dock over looking Spring Creek Channel. Lake Seminole, GA is World Renowned for Large Mouth Bass Fishing Tournaments. Great fishing off the dock. Panoramic Views from LR. Covered boat dock with running water and electricity. Very close to multiple public boat landings closets is (Big Jims'-Spring Creek Ramps). We love making your stay at 'Southern Comfort' just that. We WELCOME you to settle in for a comfortable, relaxing time. We offer Discounted Weekly Rates, 7 night stays. Lake Life at its' best in natural, diverse and beautiful setting on Lake Seminole. This setting affords guests lots of unique views to enjoy and relax. Central location to spend time on day trips around quaint and charming Southern Towns or a day down to Panama City Beach, FL or exploring caverns in Mariana, FL or heading off for some fun at some some of our local wineries all within 60 mile max radius. A day trip to Tallahassee, FL to visit beautiful Wakulla Springs to swim in the beautiful springs or take a boat ride to learn the history of this Historical Place, or take a tour of Natural History Museum downtown Tallahassee. We have lots of things you can enjoy if not fishing. Our Goal: Take care of your expectations/requests First to fulfill your needs. We want you to take your experience back home to share with family & friends. We are always happy to answer all ?s or concerns prior to booking. This helps ensure we are able to meet your Expecations & answer your ?s prior to proceeding or your arrival. We do require all guests read our contract and sign Acknowledgement Page & return to owner within 24 hours after booking online. Large comfortable house with private covered boat dock with electricity & running water. On Spring Creek Channel. Perfect, peaceful location. Relaxing views from comfort of inside LR or outside porch with large yard with plenty of parking space in front/side yard for multiple boats. High Definition TV, A&T/Direct also with local channels & National Weather Channel. Close to public boat ramps for putting in, and bringing your boat back up to covered boat dock with running water & electricity. Included High Speed WIFI in house with Netflix. Bring your Smart Phones. Beautiful views of Sunrise off dock. Quiet neighborhood, grill/fry in back yard. 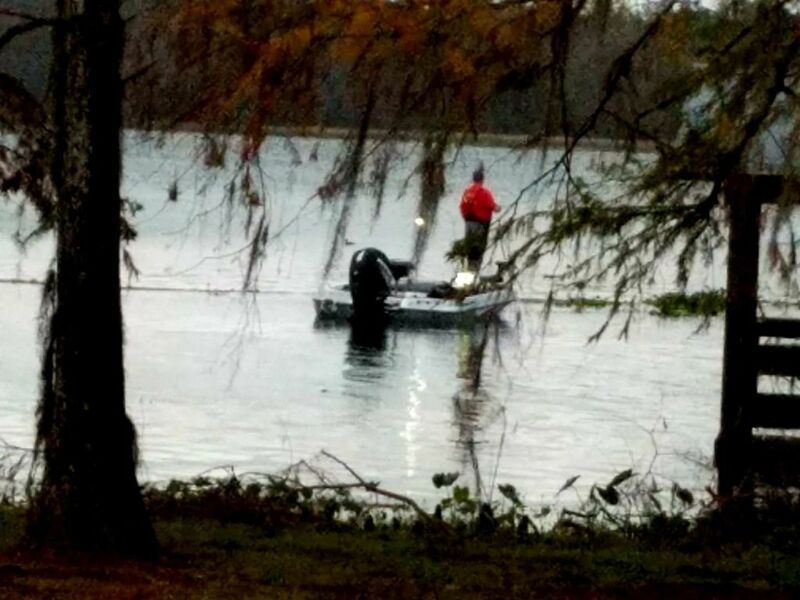 Lake Seminole, GA hosts multiple Bass Fishing Tournaments year round. Hang out and fish off your private covered dock. Lake house very clean and updated comforts. Wake up, step out in back yard and head straight to your boat under covered dock early to catch the fish jumping. High Definition Direct TV, LR & Mstr King Bdrm. Queen & Double Bdrms with extra cot & air bed available, with extra linens/pillows & 2 extra comfortable sofas overlooking the lake. Shed in front with electrical outlet for charging boat batteries or storage of equipment. Both baths are large with full tubs/showers , 1 fresh clean towel-per guest/hand towels & body wash. **If you like LOTS of towels, plz bring extras**with you. New Washer/dryer on porch. It is very peaceful and quiet Lake Life community. It's a great place to hang out, fish or Duck Hunters or Gator Hunting Season. From the comfort of your LR or private covered dock, can sit and watch the beautiful sunrises or fish right off the dock. LAKE FRONT - Water Front lake house. Yes, house is on Lake Seminole, GA (Spring Creek Channel) Both House & Covered large Dock are on water. Beautiful Sunrise & full moons in your backyard on the water. Front your private large Living Room overlooking lake, watch the Sun Rise every morning. House & dock are all on the Lake. Waterfront with covered dock for 2 boats or 1 pontoon. Yes - Lake Seminole, GA N Shore, with a large covered oversized dock has running water & electricity- holds 2 bass boats or 1 pontoon. ON LAKE Great location for Duck Hunters or fishing guests. Yes, 1 Clean Towel provided, per guest. If you like LOTS of towels, owner suggest plz bring extras. Stocked, but if there are specific utensils you like must bring your own. No frying fish inside, plz bring your owner fryers for setup in back yard. Large table seats 6/8 + bar seats 3 + glassed porch has 2 extra tables that will seat 7 on large porch. Great place to gather with family for Reunions, Birthdays, Catching Up or Holidays. **WiFi Free at Big Jims Oyster Bar**, ask for password there. OR bring your own wireless devices, MiFi, IPhones, etc. Direct TV with Local channels in LR & Mstr. Great Rates for Wonderful Ole Lake House with Oversized Covered Boat Dock w/running water & Electricity! Welcome! Freshwater Fishing Sport or Peace & Quiet Getaway. Quiet & Peaceful neighborhood on Spring Creek, Lake Seminole, GA. Back porch perfect for enjoying 'seasonal' early morning coffee, or sitting/watching sun come up or full moon rise. Lots of room to Fish on covered dock. Peaceful & Tranquil experience while hearing and seeing sounds of jumping fish. Kyack, Canoe rentals @ Seminole State Park. Enjoy dining out at some of our local establishments. Steaks, Seafood or Breakfast/lunch. Lots of day trips to GA's Quaint Small Towns or close by Wineries. Stop in & say Hello to Ms. Virginia @ The Front Porch downtown Donalsonville, GA where you are bound to find an assortment of unique gifts. This place was awesome!!! We caught a few fish off the dock. The view was absolutely beautiful. We will be back again. The owners gave us alot of information. Thanks Christine for letting is know yall enjoyed your stay & were able to catch some fish off the dock. We hope to Welcome all of you back anytime. We had a guys fishing trip and spent four days here. The owner did a great making sure our stay was as pleasant as possible by providing thorough details ahead of time, and making sure we always knew how to access her if necessary.. Also really enjoyed chatting with the neighbors...and they offered some great fishing advice. The dock was more than suitable for two boats, and electricity was available to charge our batteries each day. Sleeping accommodations were very comfortable, and the place was clean. This place was everything the owner had said we really enjoyed our stay. Far enough away from everything but yet still close enough! Yall are always Welcome back anytime Billy. Continued luck always with your BASS Tournaments. Thanks for trusting us to ensure your comfort & place to hang out while fishing Seminole. Southern comfort was a great property. It was very quiet at night and very relaxing. It was very homey and we enjoyed it from the moment we got there. It was very clean it was very well thought out. Everything that we needed was right there. We would recommend it to anyone. It was our pleasure to Welcome your family as our guests. Glad to know you all enjoyed The Pond House Restaurant. You're always Welcome back anytime to stay @ Southern Comfort Lake House on Lake Seminole. We are happy to know your time was comfortable & relaxing. The house was in a perfect location for our visit. 2 miles from Spring Creek Park and Big Jim's. Very Clean, older house but very clean. Everything you need to have a pleasant stay. Lake Seminole. 1 mile from Big Jims Oyster Bar. GREAT fishing & relaxing in comfort on the water. Large Covered Boat dock with running water & Electricity. Offers fish cleaning station with water & electricity. - A terrific extra bonus for our fishing guest & great location for Duck Hunting in Spring Creek Channel of Big Water. Activities: Water ski from Seminole State Park, hiking nature trails, picnics, family gatherings. Rent canoes or Kyacks @ Seminole State Park 5 miles away. Great central location for wondering around local area & enjoying small town attractions or dinning out @ one of our lake community restaurants. Tour some of our local Southern Wineries 50 miles or less. Explore our local town of Donalsonville, GA.
*DISCOUNTED WEEKLY RATE (7 nights) for 2 guest - TAX & Clean Charge = $75 Expedia takes Average of nightly $130 / 2 guests & *Discounted Weekly Rate* (equals 'AVERAGE' you see on listing. This is on ALL listings with Homeaway / VRBO, IF owners offer Discounted Weekly Rate & we do. This average is Expedia's decision to Post it on listing as Average. *Lake Front Home is not suitable for minors under age of 7 *Questions, Welcome to send inquiry. Owners always happy to go over options or answer questions in advance **Minimum Age of 25 for anyone signing our contract or paying online* Person who pays must be named as guest on Acknowledgement Page when you return signed/completed, after booking. Long term rental amounts (over 2 weeks), send inquiry, happy to discuss rate details *CANCELLATION POLICY* is Stated when guests puts up CC #. Plz read when you book. *Shows up to ensure you have Acknowledged prior to paying* No other Cancellation Statements take priority over Online Disclosed Cancellation Policy. Owner happy to work with any guest who has unforseen circumstances & has to change after grace period, just call or text.